The Ecological Culture Initiative is proud to offer fresh, organic, locally grown vegetables to the local food pantries of Hampton Bays. 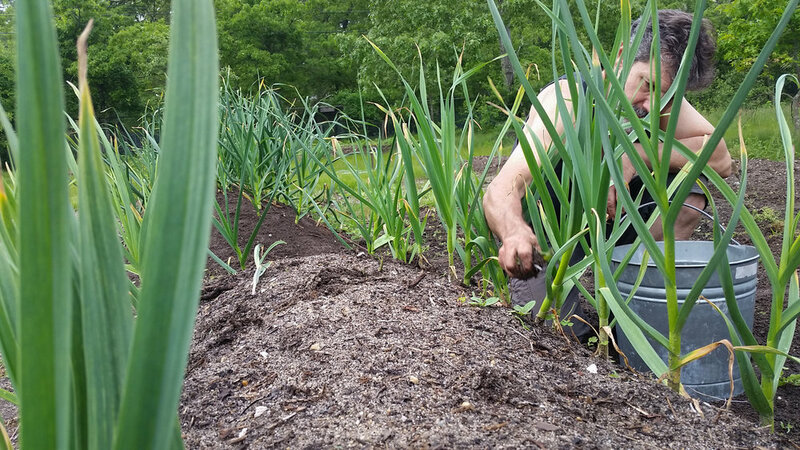 We are growing heirloom variety produce in the Good Ground Heritage Garden located at the St. Joseph Villa in Hampton Bays, and providing healthy, fresh food to community members in need. Often food pantries give out high sodium and over-processed foods, however it is our mission, with the help of local volunteer groups, to grow and distribute vitamin-rich, delicious, fresh vegetables and herbs to those in need. 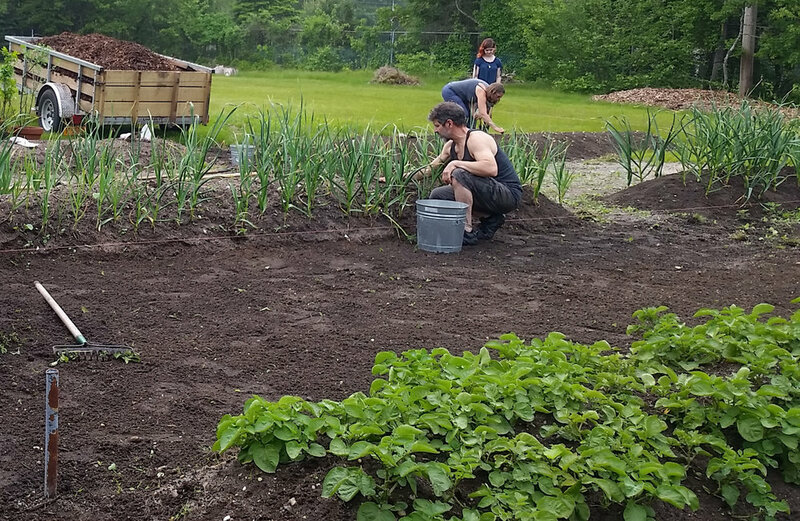 The Good Ground Heritage Garden space is currently 60’ x 120’, and contains 6 hugelkultur beds made by our Organic Gardening students and volunteers. 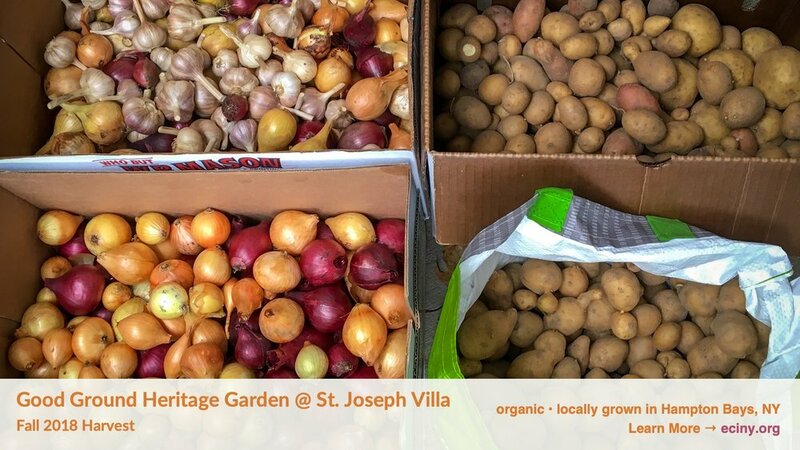 This past week we made a delivery of potatoes, onions, and garlic to the St. Rosalie’s Church Community Food Pantry in Hampton Bays. The need for fresh food was evident as it was realized that this is a very active food pantry. In the next growing season, with the help of scout troops and other volunteers, we will build wood-sided raised beds in order to increase the amount of produce grown. We plan to grow high yielding varieties such as plum tomatoes, beans, hot peppers, and a large variety of greens. Seeds from the Good Ground Heritage Garden are collected, processed, and saved for the Good Ground Seed Library, another one of ECI’s initiatives. Our seed library is located in the Adult Reference section of the Hampton Bays Public Library. Here, individuals can take up to 5 packets of seeds per month, for free, to grow in their home gardens. The Good Ground Heritage Garden provides an opportunity for community members to volunteer and learn how to grow their own food, which they could then use to start their own garden at home. Community service hours are available as well. 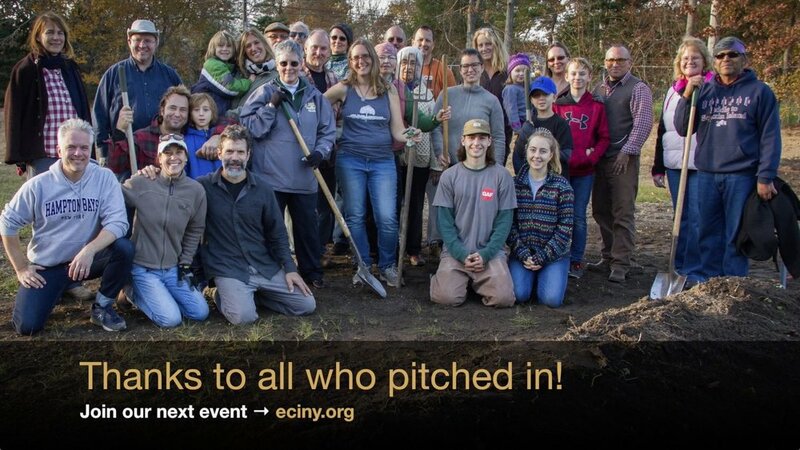 Please contact ECI if you are interested, we’d love to see you in the garden!